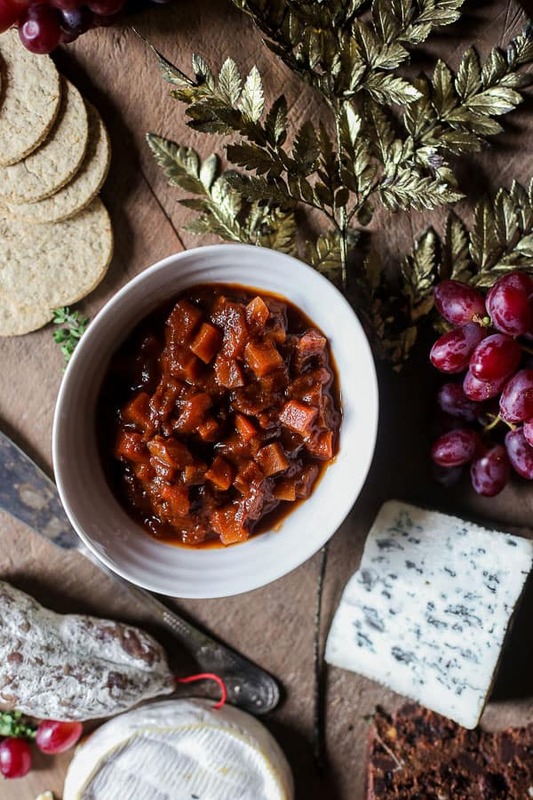 This Boxing Day Ale Chutney is the perfect addition to your cheeseboard. It’s also particularly delicious with leftover Christmas ham or turkey. Sweetly spiced with chunky vegetables and plenty of tang. Boxing Day is definitely my favourite day over the holiday period. It has none of the high expectations of Christmas Day. There’s no early morning hysteria or panic because you forgot to put the turkey on/buy the Brussels/wrap Adrian’s present. I spend most of Christmas Day in the kitchen, rushing back and forth between filling glasses with Bucks Fizz, trying to be with the children for the opening of every present and shooing Billy Buddy away from the mince pies. It’s exhausting. Boxing Day has none of that palaver though. You can lie in, well you can if you don’t have children. It’s not frowned upon to have chocolate for breakfast as it’s technically still Christmas and all those Lindor Lindts have to be demolished before New Year. You’re free to spend all day watching movies, drinking the Bucks Fizz you didn’t really have time for the day before whilst wearing your new Christmas jammies. Plus you can eschew cooking for cheese, biscuits and cold cuts and the trifle that you prepared on Christmas Eve. At least that’s how I roll with Boxing Day and I will not compromise it for anyone. 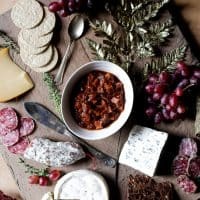 As anyone knows who has prepared a Boxing Day buffet for all the Christmas Day stragglers the accompaniments for your cheese and meats are so important. It’s all very well splashing out on decent stilton and the good oatcakes but since you are dumbing down the cooking aspect of it then the effort has to show somewhere so you can still wear your perfect host/hostess crown with pride. This is when preparing your Boxing Day Ale Chutney early doors in December will pay off dividends. 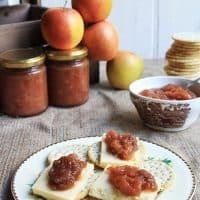 I have been making this Boxing Day Ale Chutney for a few years now when I realised I needed a more everyman’s pickle to go with the cheeseboard. I had Courgette Relish and Stem Ginger and Apple Chutney but my family were clamouring for more of a ploughmans preserve. This Boxing Day Ale Chutney fits the bill absolutely. It’s simple to make since after only 15 minutes of chopping you just throw everything into a large saucepan to get to know each other. It doesn’t have a long cooking time compared to other chutneys, just an hour or two, and can pretty much be eaten straight away. However, if you decant into sterilised jars then it will also keep for a good few months, or until you open it on Boxing Day. Boxing Day Ale Chutney is beautifully chunky with root vegetables, sweet with tomatoes, dates, spices and gluten-free pale ale. It’s also tangy with cider vinegar and mustard so holds its own against strong cheese and robust meats. 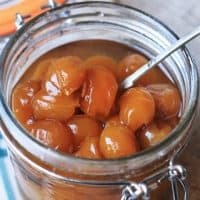 The best thing is if you decide to get ahead and make your chutney now then you’ll have plenty of jars to give away as Christmas presents. Then all your friends and relatives can reap the benefit of your Boxing Day Ale Chutney too. I guarantee they will be begging for the recipe. If you make this Boxing Day Ale Chutney then please leave a comment below and/or give the recipe a rating. If you make the recipe or use it as a building block for another delicious creation, I’d also love it if you tag me on instagram. It is so lovely for me to see your creations and variations of my recipes. 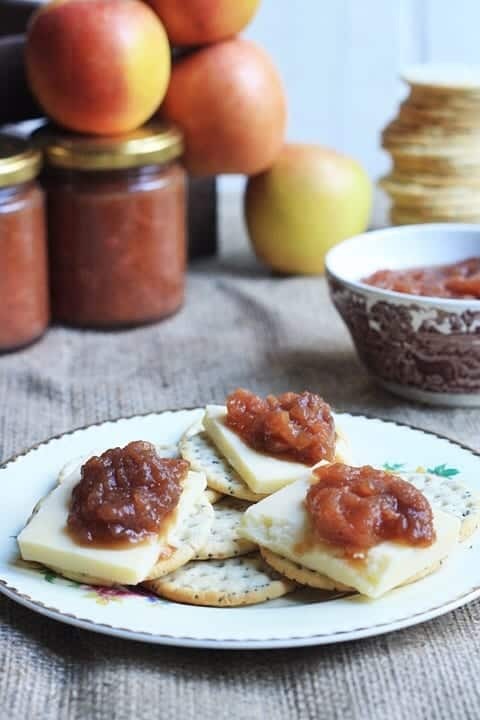 Boxing Day Ale Chutney is the perfect addition to your cheeseboard. It’s also particularly delicious with leftover Christmas ham or turkey. Sweetly spiced with chunky vegetables and plenty of tang. First peel and chop the vegetables into even 1.5cm sized cubes. Put all ingredients into a large preserving pot with 150ml water and 250ml of the ale. Bring to a gentle simmer, stirring occasionally, and cook for an hour. Take the chutney off the heat and pour in the rest of the ale. Return the chutney to the heat and cook for a further 30 minutes. Remove from the heat and decant into sterilised jars*. by Pam Corbin The chutney will keep up to a year if stored in a cool dark place. The chutney will keep up to a year if stored in a cool dark place.